Home / Blog / Uncategorized / As Dubai Blink Leverages Artificial Intelligence and Blockchain with the Country’s Free Economic Zone, Should the U.S. Follow Suit? Posted June 20, 2018 by ReceivableSavvy. Dubai Airport Freezone Authority (DAFZA), a free economic zone established in 1996 by the Dubai government as a way to foster business innovation and rapidly grow the country’s economy, has announced Dubai Blink. The world’s first B2B smart commerce platform designed to utilize Artificial Intelligence (AI), blockchain technology and virtual business licenses, Dubai Blink will allow companies from around the world to connect and trade via Dubai’s free economic zone. The initiative is designed to speed up trade in free zones by providing comprehensive solutions for companies to search for services and products, negotiate, and make purchases online via a unified platform using blockchain smart contracts and machine learning. First, Dubai Blink will help solve issues around identification. Currently, there are lengthy supplier identification and validation processes. AI algorithms will help remove these obstacles by providing researchers tailored results in a fraction of the time and thus, speeding the supplier validation process. Second, Dubai Blink will address issues regarding transactions, international trade barriers, regulations and transaction fees – all of which add unnecessary layers and complexity to B2B commerce. Integrating AI and blockchain – all within a free economic zone – will radically reduce cross-border transaction costs and time. 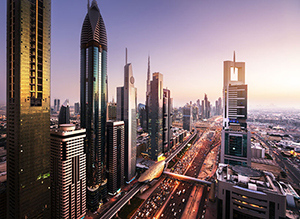 Although there have long been free economic zones in various parts of the world in some form or other, sometimes referred to as a ‘foreign trade zone’ in the United States, what Dubai is implementing is different and more advanced, as it incorporates and leverages the benefits of the latest technology around AI and blockchain. Unlike other free economic zones, Dubai Blink will enable both global companies, and small and medium-sized enterprises (SMEs) to set up digital businesses in Dubai free zones without the need to physically be on site. Blink will be replacing the existing trade licensing solutions empowered through process innovations and technologies by introducing virtual company formation. Whether run and managed by a sole proprietor or a by a large multinational organization, the free economic zone in Dubai allows for any size business to easily gain access to other organizations that might have been out of reach without the initiative. There seems to be enough here to suggest this model could be replicated across multiple regions by other countries as a way to encourage unfettered commerce and boost economies. Should such a model be replicated in the United States near international airports such as Hartsfield-Jackson in Atlanta, JFK in New York, O’Hare in Chicago and LAX in Los Angeles? Perhaps, but in the U.S., there appears to be greater concern around ensuring no unlawful activity occurs in and around international airports than in leveraging technology in new and innovative ways to boost commerce. While safety and security in and around airports is critically important, it does not have to retard economic innovation. By utilizing the strengths of AI – where machine learning can help facilitate rapid growth without high costs or a major influx of personnel, and blockchain – where the concept of highly reliable distributed ledgers is incorporated, the U.S. should be able to not only replicate what Dubai is doing but do it on a much larger scale. From a commercial perspective, there seems to be an appetite for such an initiative in the U.S. right now. Only time will tell whether there will be an appetite politically and socially.